According to a report on Monday, Apple recently spent more than $200 million to acquire Topsy Labs Inc., a social media analysis firm specializing in tracking Twitter trends. Apple confirmed the purchase to the The Wall Street Journal on Monday with a boilerplate statement regarding recent acquisitions, declining to elaborate on deal. "Apple buys smaller technology companies form time to time, and we generally do not discuss our purpose or plans," said an Apple spokeswoman. 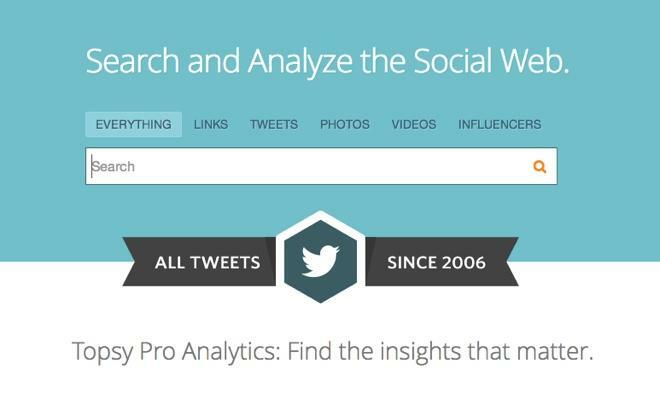 Topsy offers highly targeted analysis of Twitter's "firehose," or the stream of tweets posted to the microblogging service. As a Twitter-certified partner, the firm looks at tweets and other user data to track user sentiment, find influencers for specific subjects and measure the effectiveness of Twitter ad campaigns, among other metrics. It is not known what Apple plans to do with the company's assets, but the publication notes Topsy's technology could be applied to iTunes Radio to help identify and recommend artists or songs trending on Twitter. Another guess involves real-time analysis of market trends to sell advertisements on Apple's new Internet radio service. Reports from 2010 claimed Apple had tried to strike a deal with Facebook that would connect the massive social network with iTunes, but negotiations ultimately failed, leading to the creation of the now defunct Ping social network. While mere speculation, the Topsy buy could bring a sort of unofficial connection with Twitter, though Apple could, of course, be looking to use the tech for something else entirely.